How much will our electrical cost be to run the system? These days, 99% of our lighting systems are sustainable, energy efficient LED which consume up to 80% less electricity than the older halogen/incandescent lighting systems. We can install a complete 25-light low voltage lighting system that will consume no more electricity than one (1) 100w light bulb. A transformer is a unit that is plugged into an electrical outlet. The transformer converts your 120 volt house current down to 12 volts. I have tried to light my landscaping with low voltage lights that I purchased from the home center store. Why doesn’t it look like some of the other beautifully illuminated homes in my neighborhood? This is a common problem that we see frequently. First of all, the lights you will find in the home centers are usually of a lower quality that is not rated for the higher wattage lamps. Additionally, LED lamps vary greatly in quality, and you typically will not find the higher quality LED products in the big-box stores. Secondly, you need to have some experience with lighting to understand voltage drop and load balancing. Voltage drop can be caused by several factors, but the most common cause is to put too many lights on the same wire. The more lights you put on a “home-run” the lower the voltage will be at all of the lights. LED lamps also have a specific operating range. If your lamps do not have the appropriate voltage supply, they will not operate properly….. If you want it done right, it is best to leave it to the professionals. Why are LED lights so white? Some that I have used almost look blue and it looks very disturbing! Again, this is an issue of quality. The color of your lights is measured in degrees Kelvin. To get a natural lighting effect, the color temperature of the light source must be understood and used in accordance with the desired effect. Can you light tall trees and buildings? Absolutely! With the proper wattage lamps and optics, we can light just about anything. Would I save money if I buy the lights and have my yardman install them? Yes, and I have a large number of clients that have unfortunately taken this route at first, only to suffer unnecessary aggravation and waste their money. 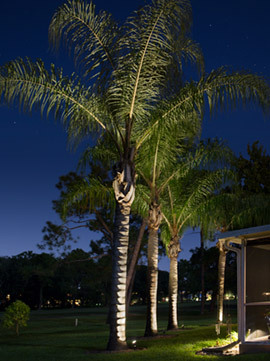 In Florida, state licensing is required of any contractor installing specialty lighting systems. Even though it is low voltage, that does not mean low risk. These are electrical systems that require knowledge, training and understanding. In fact, a low voltage lighting system creates 10 times the amperage that a 120v does and you could face serious issues, including fire hazards, if it is installed improperly. I paid a lot of money for my landscaping. Are you going to destroy my yard during the installation? No. All of the work is done without machinery. Also, unlike high-voltage systems, it is not required to bury the wire more than 6 inches deep. The front of an average home will usually take one day to complete. Is your lighting safe around pool areas and water features? Yes. Low voltage lighting is very safe around water. In fact, we frequently install fixtures under water to highlight ponds, waterfalls, etc. However, there are a few rules when installing lights around water and these rules are defined in the National Electric Code.